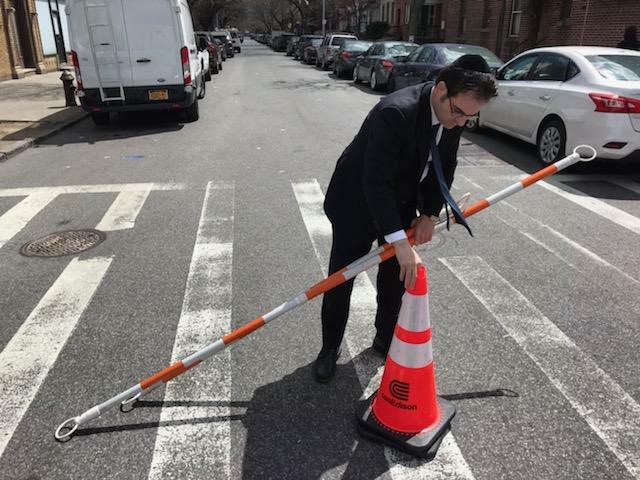 City Councilman Kalman Yeger opened a Boro Park street Wednesday that he said had been closed illegally by Con Edison. Yeger: Hello @ConEdison. Since you illegally closed 44th Street, I went out and reopened it. It’s ok, because you don’t have anyone even working on this block. Thanks. Con Ed: Please provide us with the exact location so we may look into this for you. Yeger: Corner of 15th Avenue & 44th Street, Brooklyn. Con Ed: Thank you for your patience. We see that we have permits to work at this location. Permit numbers B012019078D73, B012019081E05 and B192019070A05. We apologize for any inconvenience this has caused. Work will begin shortly and the barricades will be put back for public safety. Yeger: Not a chance @ConEdison. You do NOT have permits to close the street. You have permits to do work. But Stipulation #23 on your permit requires that 44th Street have an 11 foot lane open to traffic. Don’t lie. Con Ed: Thank you for bringing this to our attention. Please DM us for additional information. Thank you! Yeger spoke to Hamodia Wednesday afternoon about the incident. A Con Ed spokesman was not immediately available to respond to Hamodia’s request for comment. Yeger has frequently battled with utility companies that close streets, both in meetings with company officials and on social media. Just this Purim, Yeger walked up to workers who had illegally closed East 8th Street at Avenue I in Midwood. Yeger told them they had no legal right to block the street, and they left. “I called the utility company, a subcontractor for National Grid, and they told me they had no idea why the workers were there on that day,” Yeger told Hamodia. 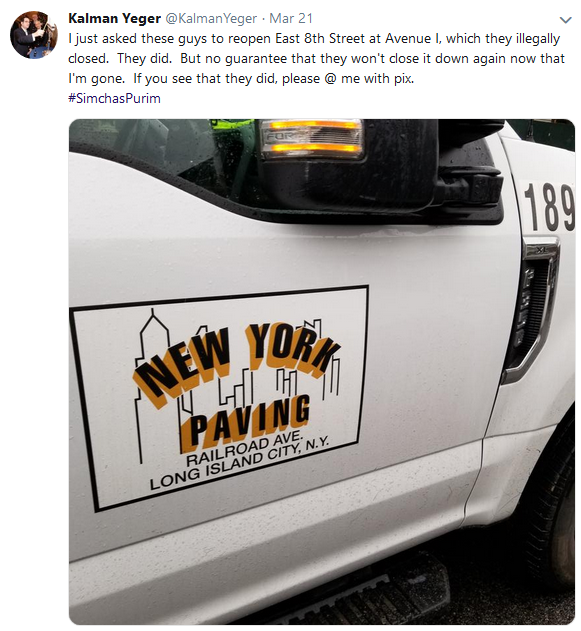 Yeger said he doesn’t encourage people to go around moving cones, but if they see a street that may be illegally closed, they should take photos, use social media and tag Yeger, the local community board, 311 and DOT; or call his office, the local community board or 311.